This is where you will get the lift, firmness and roundness you want. Bootylates will work you, strengthen you, stretch you and help you get stronger. Your clothes will fit you better, you will feel better and others will notice the difference, too. 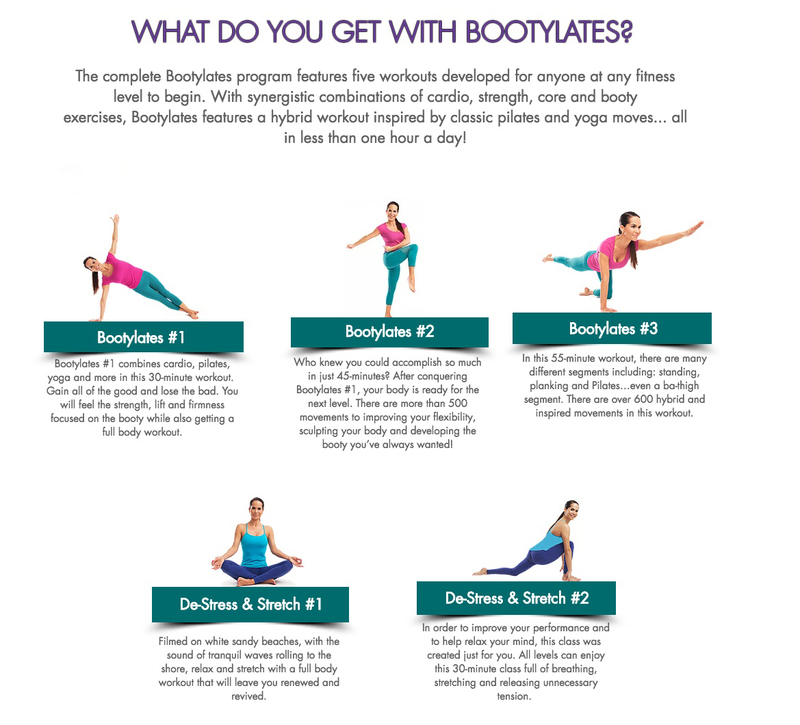 BOOTYLATES IS NOT JUST A WORKOUT, BUT AN EXPERIENCE FOR YOUR BODY AND FOR A FIT LIFESTYLE. When you do Bootylates you will not only look better, but also feel better. Get BOOTY TIGHT with Bootylates! 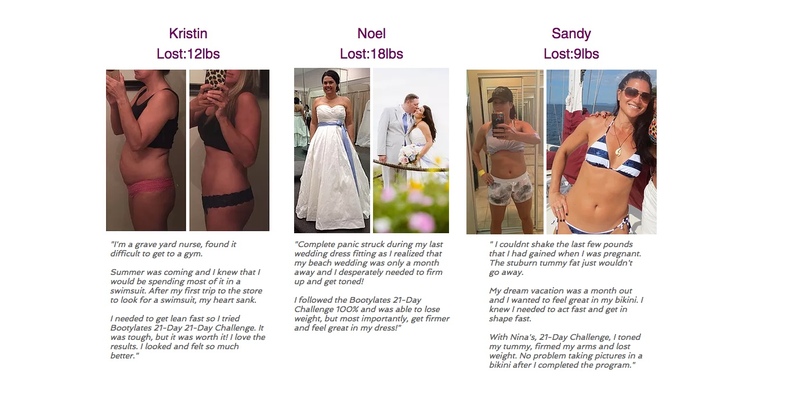 ”Nina's 21 day challenge is a proven, effective way to transform your whole body in 3 weeks. I didn't believe it until I tried it and it worked. I lost 12 pounds on the 21 day challenge by changing the way I eat, exercising and sticking to the regime. I will be a client of Nina's for life. She not only changes me on the exterior but she has changed my mentality as well. I now know there is nothing I cannot do! They Did It With Bootylates! Have a short time frame and need maximum results? 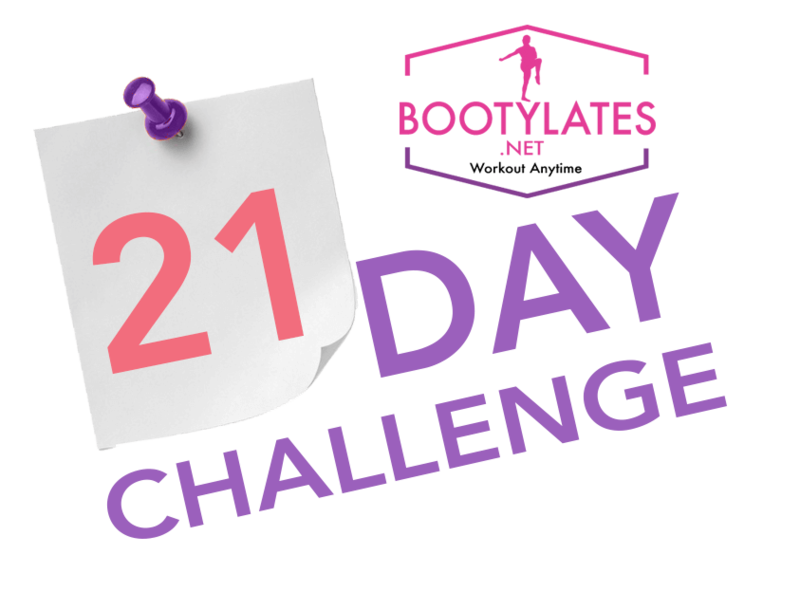 Bootylates 21-Day Challenge is designed to kick your booty into shape with a specially programmed nutrition and fitness program. Hear what others have had to say! • That’s only pennies a day! • A complete program awaits you! Daily emails from Nina, a food plan, additional healthy recipes, meditations and more to help you achieve optimal results. Stream or download your workouts and tools from your laptop, tablet, or mobile device. Now you can bring your Bootylates On Demand programs with you wherever you go. If your traveling for work, vacationing or would rather not go to the gym, your Bootylates Program is available anytime, anywhere. I enjoy getting to know each client’s goals and special needs over the phone, first. Then, during our 1st scheduled session, each of my clients receives a postural analysis so I can learn their strengths and weaknesses. I have been instructing for almost 20 years holding certifications in 3 different methodologies of Pilates. 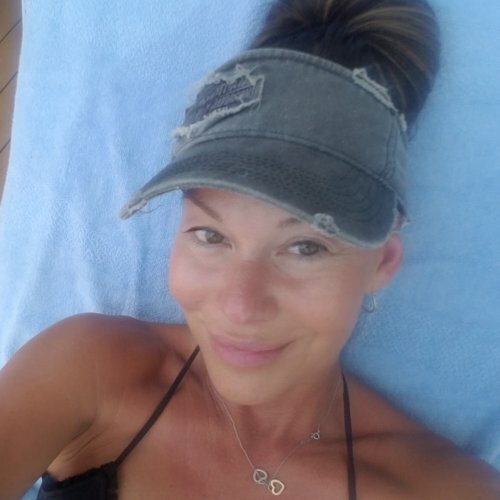 I’m also certified in: Pilates for Kidz, Pre/Post natal Pilates, Bootylates, Indoor Cycling and I have enjoyed competing in 3 fitness competitions. It is always been a privilege to own and operate Body in Mind. I take pride in my business and am selective when hiring instructors. Only the best for my clients. I have a compassionate and extensively trained staff. Over the years I’ve learned to accommodate people’s financial situations. This is why I created the affordable Bootylates program and the reason Body in Mind offers such a wide variety of classes. These tools help people focus on bettering their health and wellness today to prevent medical bills tomorrow. As an overweight youth, I desired to be athletic and physically fit. I trained myself and changed myself. Once I tried Pilates, the rest was history! I was so impressed by the results and how good my body felt that I knew I wanted to teach this method. My passion continued to grow after working with so many different body types and seeing them all make improvements: pregnancies, children, athletes of all ages, cancer survivors, the elderly and even people suffering from anxiety and depression. I realize the importance of focusing on more than just the physical. We help clients find balance between their physical, emotional, mental and spiritual bodies. Missy Lisa is an award winning showgirl, instructor and entrepreneur. She is the founder of burlesque super troupe, The Ruby Revue, creator of the very successful Dallas Burlesque Festival and Houston Burlesque Festival is also the owner of the Ruby Room studio, Dallas’ premiere alternative dance studio. Seductive and talented, Missy Lisa’s diverse acts have earned her fans from coast to coast. She was crowned “Miss Viva Las Vegas” in 2013, won “Most Classic” at the Burlesque Hall of Fame in 2014 and was named one of the Top 20 Burlesque Performers in the World by 21st Century Burlesque Magazine. Missy Lisa continues to perform every month with The Ruby Revue at the House of Blues Dallas and Houston and she regularly performs in New York City and tours nationwide. A Las Vegas native who's background includes classical ballet to street funk. I have been teaching Zumba since February 2008 and its been a blast! I 've been so lucky to have performed with Beto and a cast of amazing Zumba Stars in the 2013 Zumba Fitness Concert , an absolute dream come true!!! Ronni Allen has been actively, passionately involved in fitness and nutrition for over a decade. Her passion for finding new exercises and different body movements has led her to Pilates. She fell in love with the body and mind connection that Pilates teaches. Ronni practices Pilates daily to ensure her sessions are well structured and she understands what you are feeling to better assist you in connecting to your body. She enjoys teaching many variations of Pilates to help clients reach their own personal goals. Ronni is certified in mat and apparatus Pilates, Bootylates 1 and 2, Barre and Nutrition Coaching. It all began with step aerobics (at the only gym in her town) where Christine Gorra found her passion for teaching fitness back in 1997. When a larger facility opened that connected to a non- profit hospital, she was hired there. Del E. Webb Wellness Center is a non-profit facility connected to the hospital offering physical therapy to injured individuals returning to regain their health. Christine felt very fortunate to be a part of this facility and enjoys the great members and the staff. Since 1999, Christine instructs in the following; Step, Step/Lift, Boot camp, Aqua classes, and Senior Toning. In 2009, she began teaching; Zumba, Zumba Toning and Zumba Gold. She is also licensed to teach Zumba Sentao. A native of California, Victoria began dancing and teaching dance at a very young age. She has been residing in Las Vegas where she has been working at Coyote Ugly for the last fifteen years. After many years of stomping on the bars, she found herself with serious knee pain. It was then that she discovered Nina Waldman and the world of Pilates. Working with Nina restored her knees and helped Victoria achieve many fitness goals. Since, Victoria has studied Acting, worked on various Las Vegas Independent projects, traveled internationally with Coyote Ugly, and has danced for many different Las Vegas shows and artists. She has now discovered her passion for complete body health and self healing. Beginning with her health Guru Nina’s creation, Bootylates, Victoria intends to move forward in her education so she can also help others on their journey for optimal physical, emotional, and spiritual wellness. “Longtime customer and my booty has never looked better!